Metal roofing is the obvious winner! 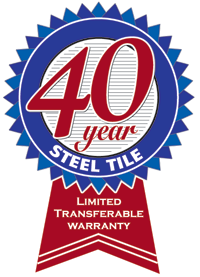 Steel Tile’s renowned roofing systems combined with Weather XL superior paint finishes with ceramic pigments that meet minimum Cool Roof solar reflectance requirements are backed by our industry leading 40-year limited transferable warranty. Steel Tile metal roofs are easy to install and require little maintenance. It’s more than just a roof over your head – it’s an investment that will upgrade the value of your property for years to come. Some companies use the term ‘Lifetime Warranty’ as a guarantee for their tin or aluminum roofs. Often such guarantees are mere hype, or contain fine-print caveats. Ask questions – whose lifetime? Yours? The company’s? The product’s? It’s usually open to interpretation. Plenty of roofing companies simply close down, change their names or disclaim their lifetime promises. Steel Tile Metal Roofing has been in business for over 30 years for a reason.